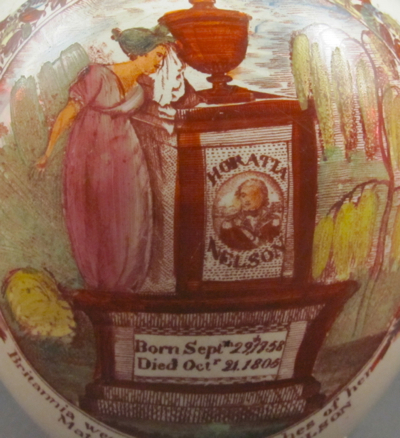 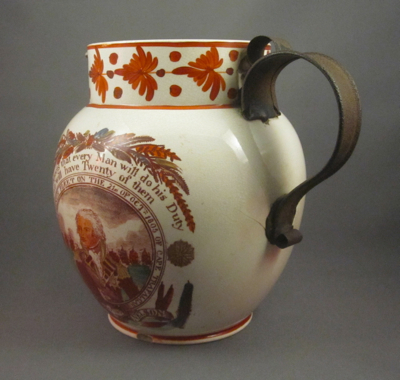 This past July I took a drive down to Virginia to visit Colonial Williamsburg, where I spent some time with Angelika Kuettner, Assistant Curator of Ceramics and fellow enthusiast of antiques with inventive repairs. 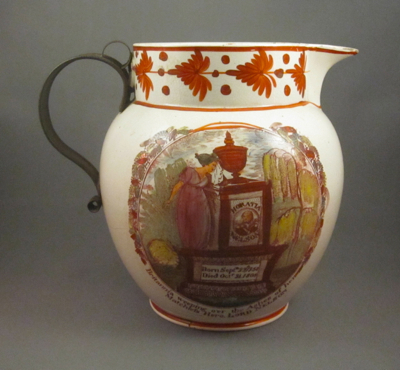 Angelika was most generous with her time and showed me recent acquisitions as well as some of her favorite pieces on permanent display in the DeWitt Wallace Decorative Arts Museum’s collection and research center. 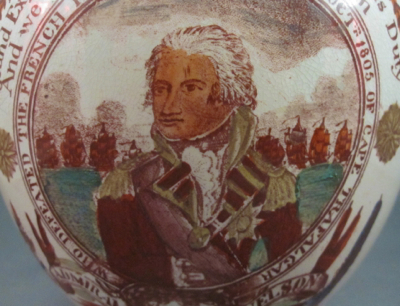 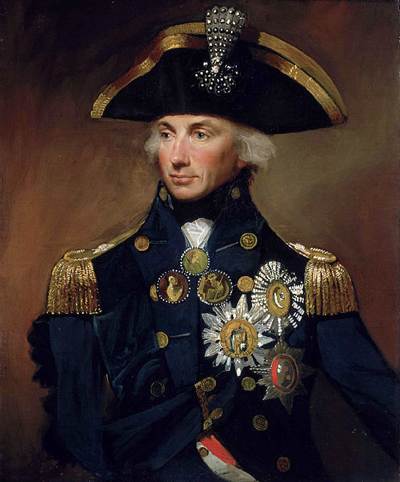 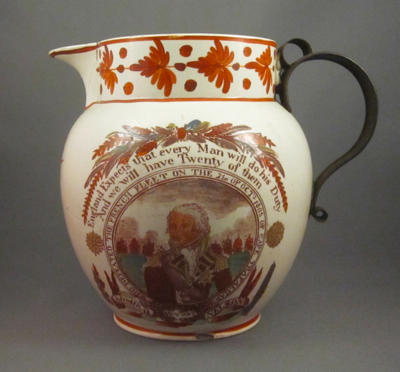 After going behind the scenes to view some recently acquired items, we walked through the public galleries, where I was pleased to see many examples of inventively repaired items and, in addition, a couple of historical references within the exhibit. 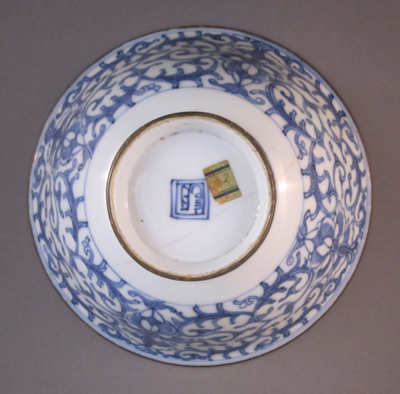 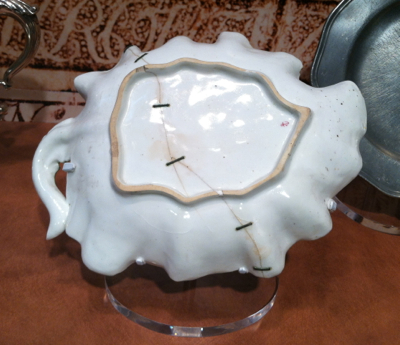 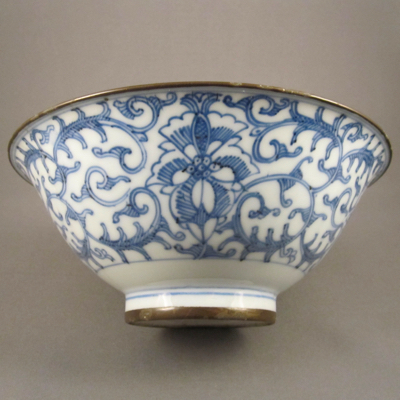 One large showcase, filled with ceramics, includes a small group titled Repaired Goods, with this explanation: “Ceramic tablewares could sometimes be mended in a manner that permitted continued use. 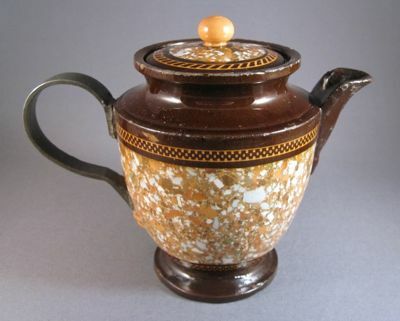 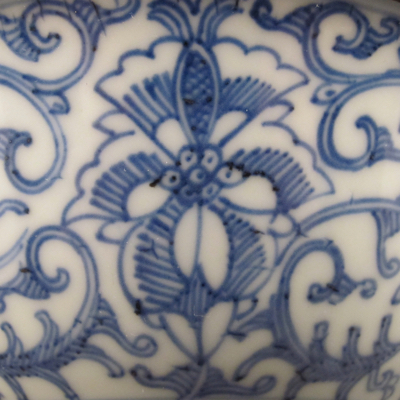 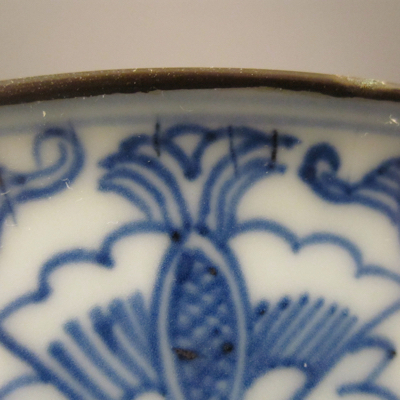 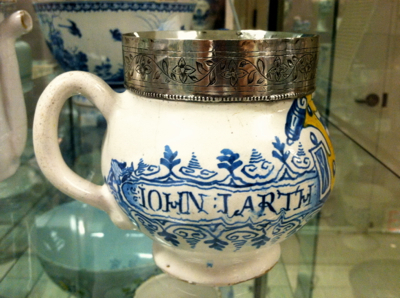 The metal handle on the small Chinese porcelain cream jug, for example, is an early replacement that allowed it to function properly. 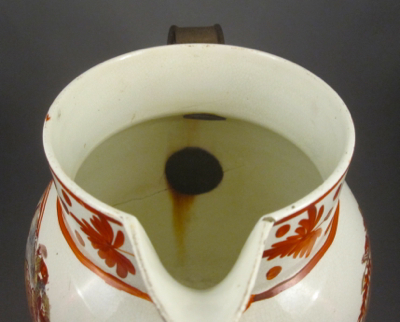 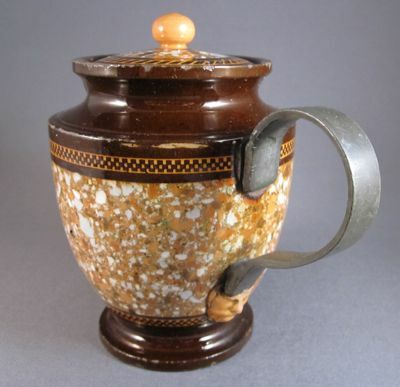 Similarly, the silver mounts on the rim and foot of the German stoneware jug were no doubt applied to cover chips…Badly broken ceramic plates and dishes, however, were tossed on the trash heap, or, in some instances, mended with rivets so that they could be displayed but not used.” I believe many stapled pieces were indeed still used for years after they were mended and not just displayed. 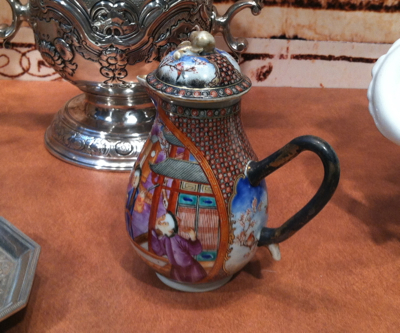 I am grateful to Angelika, and the others in her department, for their appreciation of inventively repaired items, and for displaying them proudly alongside the “perfect” examples in the museum’s vast collection. 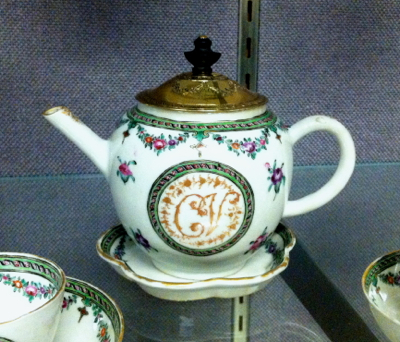 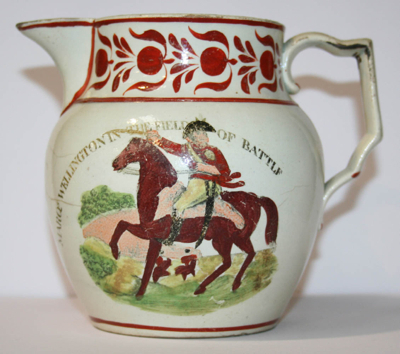 This handsome redware urn-shaped teapot was made in England in the late 18th century and stands 4-1/2″ tall. 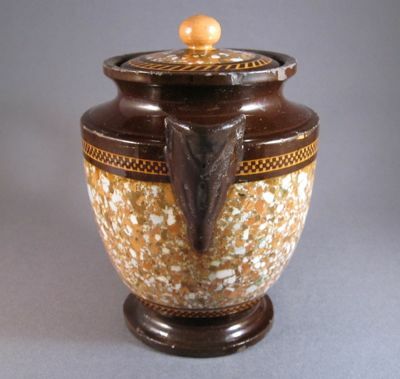 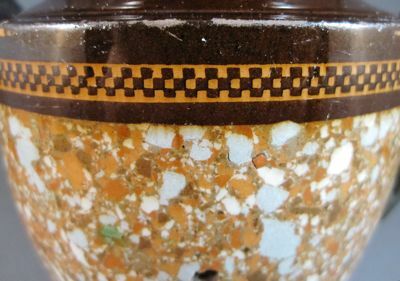 Its confetti-like agate surface decoration is inlaid with ochre, orange, brown, olive, blue, and white bits of clay. 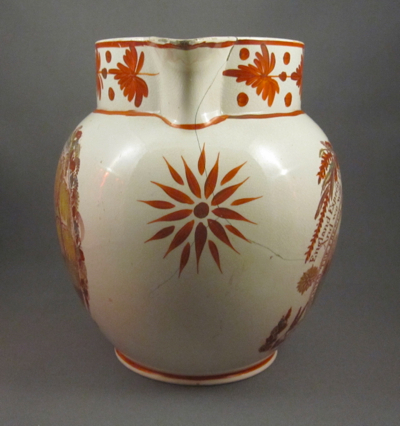 Encircling the middle is a slip-filled checkered rouletted band of pumpkin and brown. 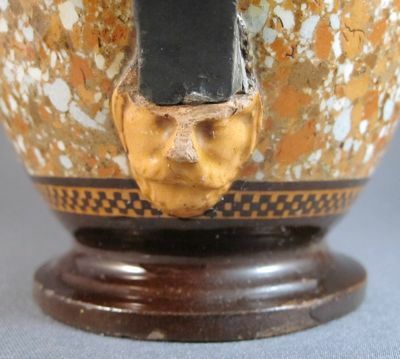 All that remains of the original handle, which must have broken off sometime in the 19th century, is a molded bearded mask terminal, set ominously askew. 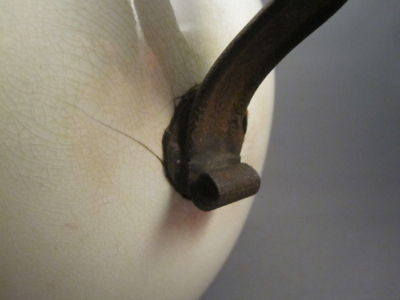 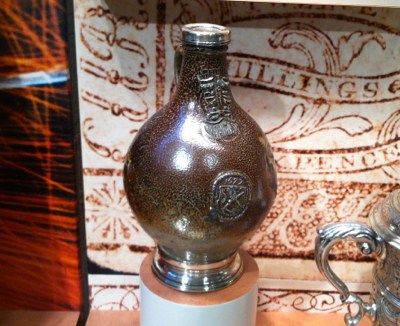 Growing out of its forehead is the lower part of a pewter handle, fashioned by a tinker to replace the broken original. 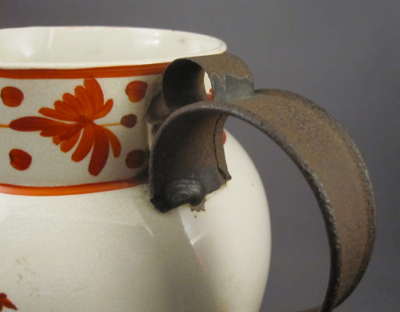 This replacement follows the form of the simple loop-shaped original. 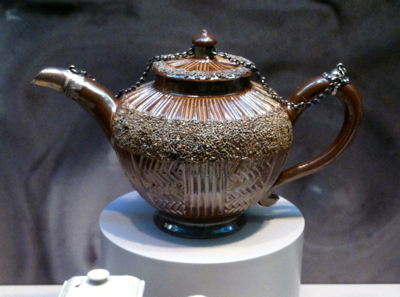 I found this piece in Maine a few years ago and was reminded of it during a recent trip to the Shelburne Museum in Vermont, where I spotted a teapot on display with similar agate surface decoration, shown in the last image below. 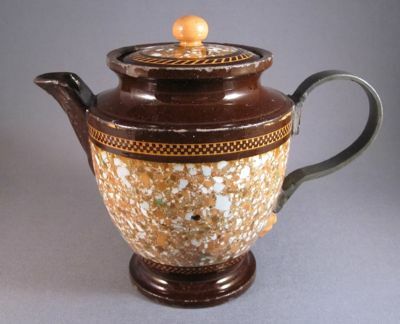 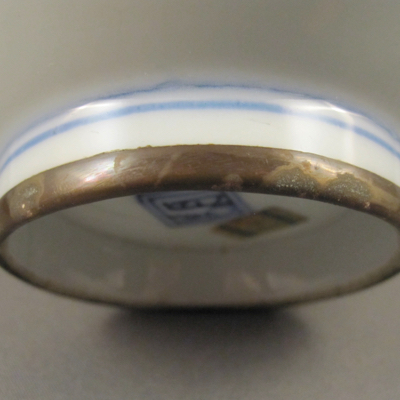 This teapot is another example of agate surface decoration, and although it differs in form and coloring, the checkerboard band decoration is similar to my collaborative whiteboard template. 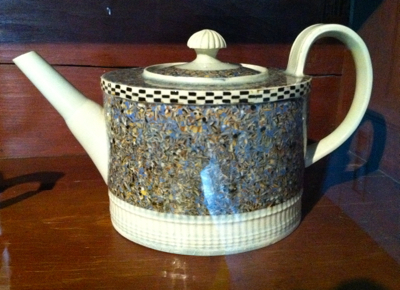 Photo taken at the Shelburne Museum in Shelburne, VT.